November 29, 2018 – We only know of six specimens of this Japanese gold coin from 1588. One of the Tensho Hishi obans was sold by Hess Divo AG for 1.1 million Swiss francs in their Auction 328 on May 22, 2015 (lot 1226). 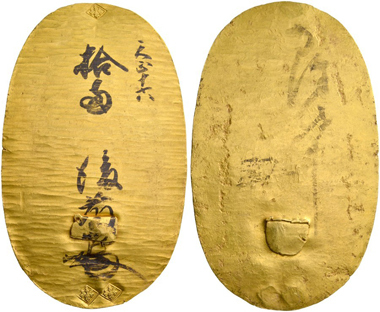 This oban is thus likely to be the most expensive Japanese gold coin ever sold in an auction. The obverse of this oban, which was made in 1588, features the signatures of the goldsmiths Goto and Kao. This piece, which was sold in 2015, was the only one available on the market at the time. General Toyotomi Hideyoshi had these gold coins made at the time of his political advancement. They primarily served as representative gifts and were not found in regular money circulation. Toyotomi Hideyoshi is not only known for achieving the country’s unification after the civil wars. He also successfully had numerous temples restored and constructed. Yet, he was also the one who divested farmers of the right to bear arms and implemented a strict class-based social system. As experts, Yuji Otani and Eiichi Ishii were asked to verify this record on November 23, 2018. Yuji Otani confirmed this record on November 25, 2018. This Encyclopaedia Britannica article tells you more about Toyotomi Hideyoshi. If you also would like to submit a CoinsWeekly Coin Record, here is more about what you need to participate.